Cirque du Soleil returns to Boston, this time with "Totem," its latest big top production. Written and directed by Robert Lepage, "Totem," opens on June 10 for a limited engagement through August 5 under the blue and yellow Grand Chapiteau (big top) located at Boston’s Marine Industrial Park. 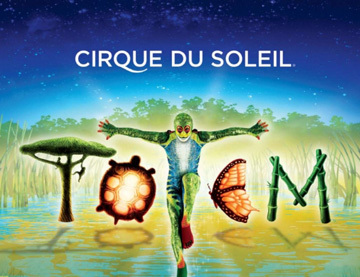 Since its world premiere in Montreal in April 2010, "Totem," has visited more than 12 cities in four different countries and has performed in front of more than 1.5 million spectators. This production marks the 9th visit of a big top show in Boston since 1993. "Totem" traces the fascinating journey of the human species from its original amphibian state to its ultimate desire to fly. The characters evolve on a stage evoking a giant turtle, the symbol of origin for many ancient civilizations. Inspired by many founding myths and lying somewhere between science and legend, "Totem" explores the ties that bind Man to other species, his dreams and his infinite potential. From a group of 20 street performers at its beginnings in 1984, Cirque du Soleil has grown to become a major Québec-based high-quality artistic entertainment organization with 5,000 employees, including more than 1,300 artists from more than 50 different countries. Cirque du Soleil has brought the wonder of its performances to more than 100 million spectators in more than 300 cities in over 40 countries on six continents. This year, Cirque du Soleil will present simultaneously 21 different shows around the world. For tickets and information, visit cirquedusoleil.com/totem.